“Rakta Karabi” by Rabindranath Tagore has been considered by many pundits as one of the pillars of modern Bengali drama. The universal appeal of the play needed to transcend beyond the confines of the limited Bengali speaking populace and Tagore himself took upon the task of translating the play to English and gave it the title of “Red Oleanders”. Unfortunately, not too many productions of this wonderful play happened in the western world. One conjecture has been that Tagore’s language, in his translated works, failed to withstand the test of time as the English language evolved over the ages. Nupur Gangopadhyay Lahiri, a medical doctor by profession but an artist by passion, recently made an attempt to present the play in a more contemporary language in order to bring forth this phenomenal work to the western readers. 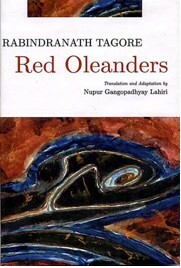 The new translation, “Red Oleanders”, published by Punashcha Publication of Kolkata, will undoubtedly help the western readers appreciate the prediction of mankind’s future, as Tagore perceived it from his vantage point, some eighty years ago. Sunil Gangopadhyay writes in the foreword of the book, , “Rakto Karabi is an especially mentionable play by Tagore. For successful staging of this play…. the ancient and incomprehensible idioms need to change. An English translation of Rakto Karabi has not yet been successfully staged. Still today, the possibility of an effective production in the western world is there with some editing and reworking of the original version. This entry was posted in Arts-Culture and tagged drama, India, Kolkata, play, poetry, tagore by sudipta. Bookmark the permalink.